Are you lactose intolerant and end up paying thousands for fancy almond milk or soy milk? 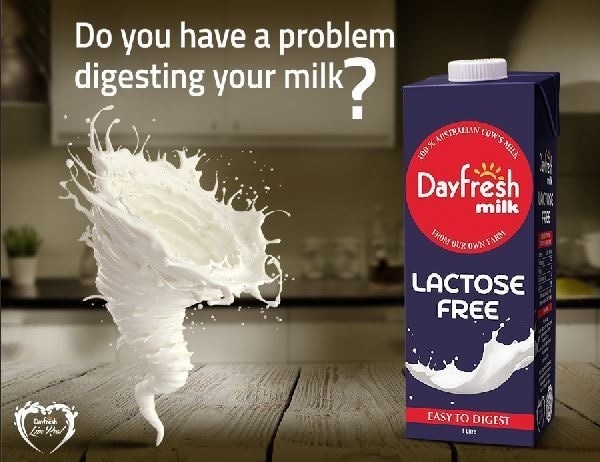 You can now stay healthy and strong without being concerned about the thought of indigestion as Dayfresh brings you Pakistan’s first lactose-free milk . Lactose is a carbohydrate present in milk. The inability to digest it is known as lactose intolerance. Consumption of milk and other dairy products by a lactose intolerant person may lead to discomfort in their stomach. Gastroenterologist Dr Furqaan Ahmed said that lactose-free milk is a good substitute for people who can’t consume it in its original form. People who cannot consume milk or dairy products can correct their vitamin D and calcium deficiencies with substitutes such as lactose-free milk or yoghurt, he said. According to the UK’s National Health Service, lactose intolerance is a common digestive problem. Some people, whose bodies do not produce enough lactase, are unable to digest lactose. Lactase is an enzyme that helps break down lactose. The lactose stays in their digestive systems, where it is fermented by the bacteria in their bodies. The fermentation triggers the symptoms. Symptoms usually develop within a few hours of consumption. Common symptoms are flatulence (wind), diarrhea, bloated stomachs, stomach cramps and pains, stomach rumbling and an overall feeling of sickness. Some people who are lactose intolerant are able to consume milk in small quantities without triggering any symptoms. Others can get sick even from the small amount of milk in their tea or coffee. People with lactose intolerance are more vulnerable to vitamin D and calcium deficiencies since they are unable to consume regular milk – which is the most commonly available source for vitamin D and calcium. These deficiencies can make life difficult as they directly affect your bones. It is important, therefore, to have substitutes for your vitamin D and calcium needs. Dayfresh Lactose Free milk is sourced from 100% Australian cow’s milk from Dairyland’s own farm. It is free from hormonal injections. The best news is that it costs only Rs180. In comparison, imported Lactose Free Milk brands cost up to Rs 600, soy milk prices range between Rs230 and Rs500 while almond milk can cost up to Rs1,000. Moreover, lactose-free milk tastes even better as it has a sweeter taste. This is because lactose in the milk is broken down into glucose and galactose while processing. As compared to lactose, the sweetening index of glucose and galactose is higher, which is why lactose-free milk tastes sweeter even without adding any sweetening substance. Say yes to milk again!